Inexorably, flowing lines led me to the Centro Galego de Arte Contemporanea (CGAC). 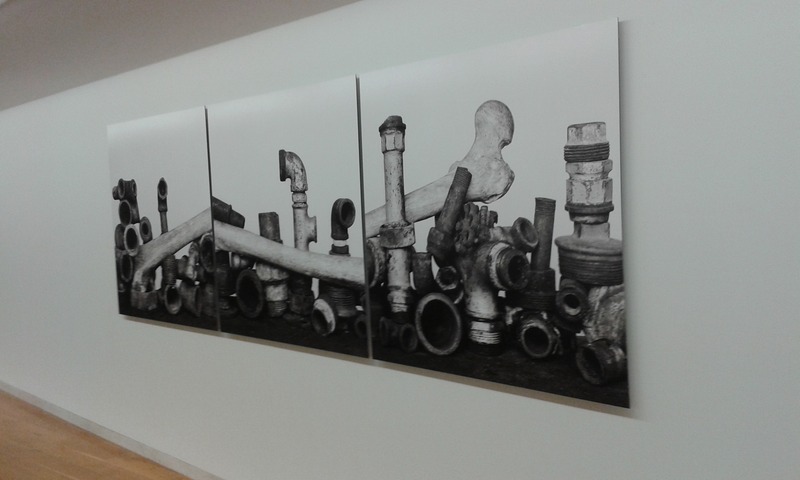 In the tryptich by Manuel Vilariño, the landscape with bones is a series of pipe joints and a human femur. Understated tone and texture make it at first difficult to immediately distinguish the artefactual from the skeletal. Yet the unique qualities of bone, emphasized by the composition, evoke a subconscious understanding that something is wrong in the landscape : fragmentary and disjointed : something of our humanity is present amongst the detritus of industry which we bear witness to. Doris Salcedo’s powerfully haunting piece presences a series of ghost like shoes. 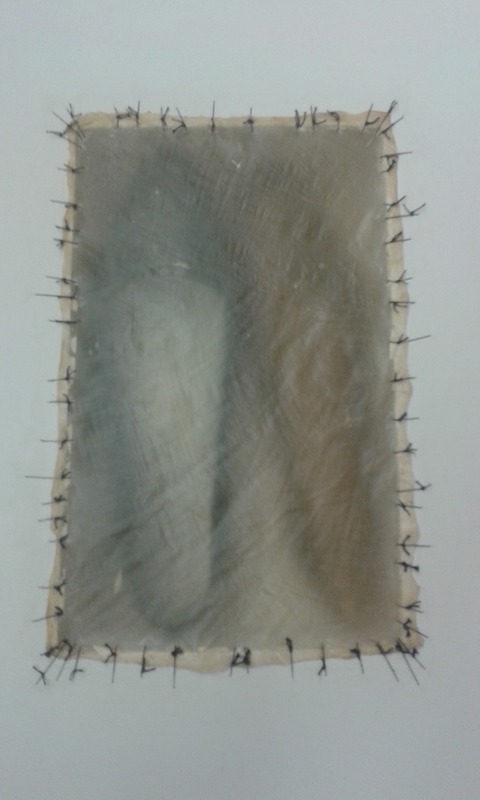 A vellum is stitched, in an operation to seal women’s shoes : captured in an organic vitrine. A state of being, leaving them out of focus, unresolved, trapped in the timelessness of the gallery. The pieces I have highlighted in the CGAC collection variously engaged with the archaeological (the human bone within Vilariño’s piece, the shoes within the pieces by Salcedo) or explicitly evoked prehistoric remains in their work (the Venus Figurines appropriated by Torres). But the expression, contemporary prehistories, could as much relate a particular kind of experience of visiting a gallery space (when undertaken without referring to catalogues or labels). The mediation of meanings (either intended or unintended) through these materialisations has much in kind with (as a prehistorian) the first encounter with an object from the distant past. There is no other voice of testimony, no text to read, it is a raw, exposed state of response ‘to the things themselves’. We then reflect from other frames of reference, from our experience, from our knowledge, and develop a sense of, an understanding, an interpretation of…. …. …. …. …. …. …..? What such gallery pieces express is an ongoing dialogue which partially reveals, not a text which delivers authoritative meaning. Perhaps contemporary prehistories are practices by which we remember the forgotten, by presencing in ways which do not privilege text, and are contingent and open to dialogue and reflection. Such pieces perhaps challenge the authority of those who would choose we forget. The conversation with the past should not be forgotten. I have highlighted the pieces by Manuel Vilariño, Doris Salcedo and Francesc Torres but there were also several other works by artists in CGAC whose relationship to the ‘archaeological’ is perhaps better known, this included an aerial photographic piece by Andreas Gursky ‘Thebes, West’ and an installation by Mark Dion ‘Boxes of the Paleontologist’. Only when I returned from the Santiago Pilgrimage did I try and find out more about Doris Salcedo’s sculpture and was not surprised to learn that there is a powerful ‘back story‘ to the piece and of the practices of Salcedo more broadly. In Andreas Huyssen’s excellent essay on Doris Salcedo’s piece ‘Unland: The Orphan’s Tunic’ he evocatively describes her works as Memory Sculpture. 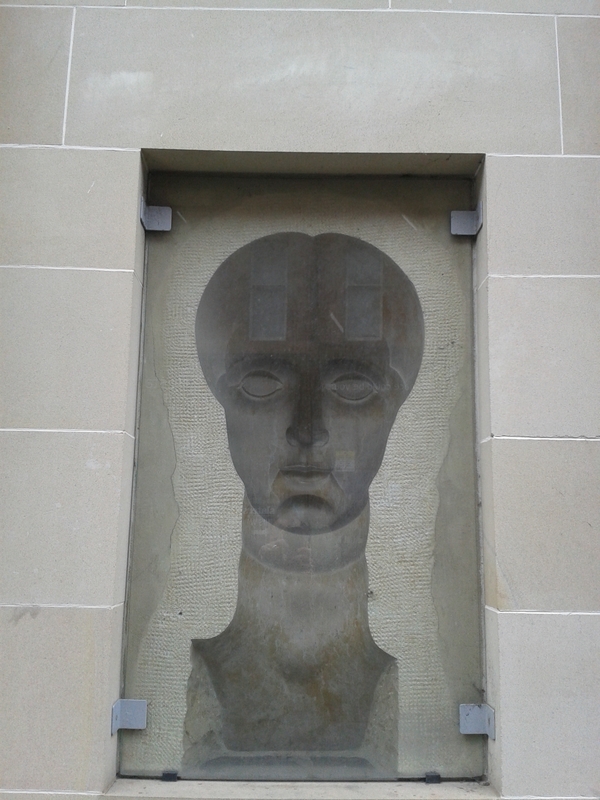 To be found in ‘Present Pasts: Urban Palimpsests and the Politics of Memory’. Equally the work of Francesc Torres, from Barcelona, has a deeply political dimension around memory and forgetting. Another project he was involved in comprised a photographic piece responding to the exhumation of a mass grave with a forensic anthropology team at Villamayor de los Montes and was entitled ‘Dark Is the Room Where We Sleep‘. Utilising complex archaeological and mapping data to create images of the hidden landscape this presentation forms a creative view of both archaeological data and ancient artefact in a contemporary artistic context. The data is combined using studio applications and traditional print techniques to create a visual response to the material, resulting in a unique set of prints. Objective, A Citywide Conversation on Sculpture, is taking place in Glasgow with 16 venues across the city exhibiting sculpture, events and performances in March and April. Having seen the map showing the locations of the venues, one lunchtime I had a quick conversation with sculpture. First I visited the Patricia Fleming Projects Art in the Public Realm exhibition at South Block which detailed the development of two projects. 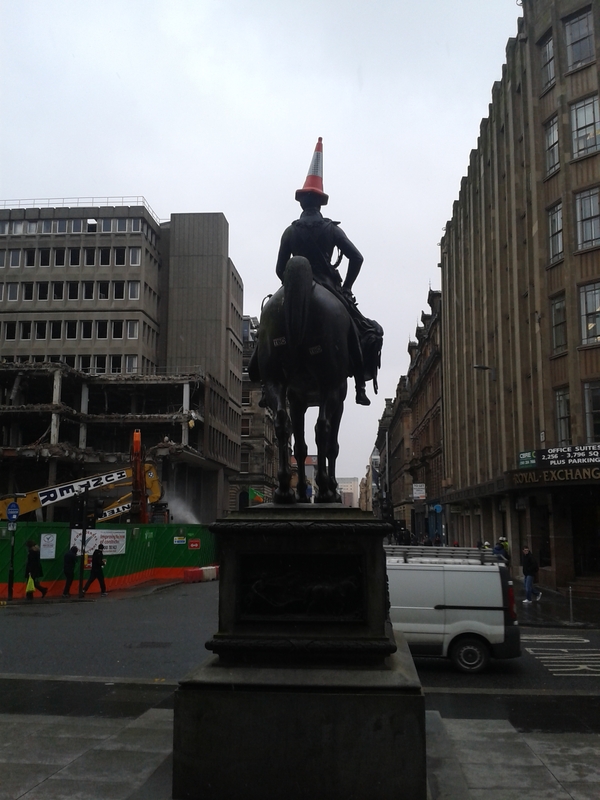 Slightly out of breath, I arrived at GOMA and passed the Statue of Wellington resplendently adorned with his usual modern hat ! Inside GOMA I had time for a brief exploration of the exhibition ‘Every Day’. It comprises sculptures from six Glasgow artists which explore familiar objects, juxtaposing, and reworking them in different media. 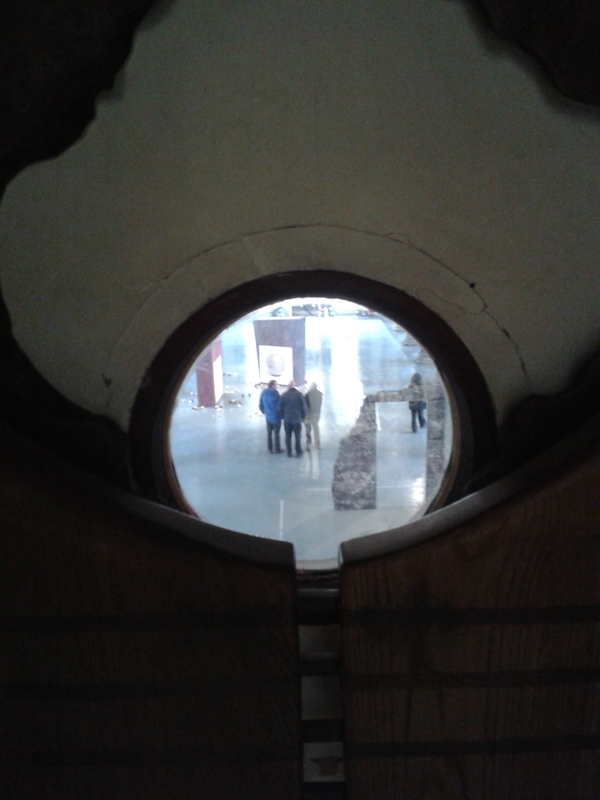 A glimpse of these is provided through Tim Steads wooden viewing room ‘The Peephole’. 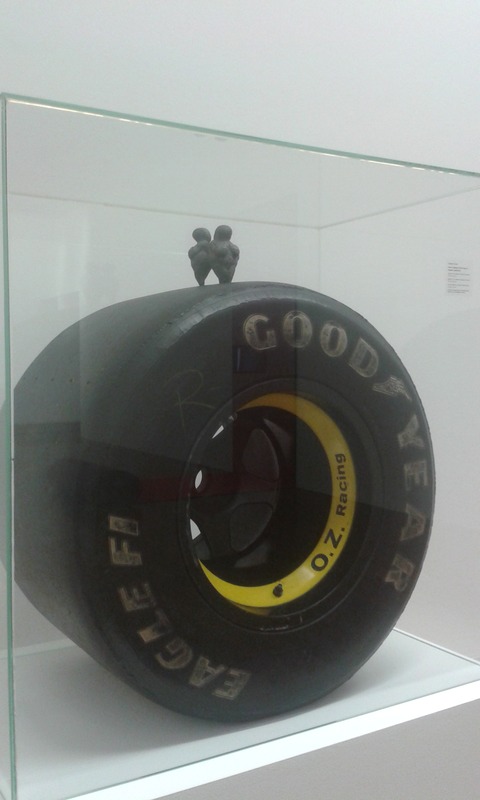 I will not reveal anymore, other than to say that there are some striking and thought provoking individual pieces, together which are well worth a journey to GOMA to explore further. Further details of Objective can be found at the GOMA wordpress website or downloaded on pdf map. go explore your city, your neighborhood, for sculpture and take part in the conversation…. Our perception of the world was radically altered when the first images of the green and blue planet were received from space. Similarly, when we fly (if we are lucky enough to get a window seat !) the views of towns, fields, woodlands, coastlines and mountains reveal patterns we can never see with our feet on the ground. 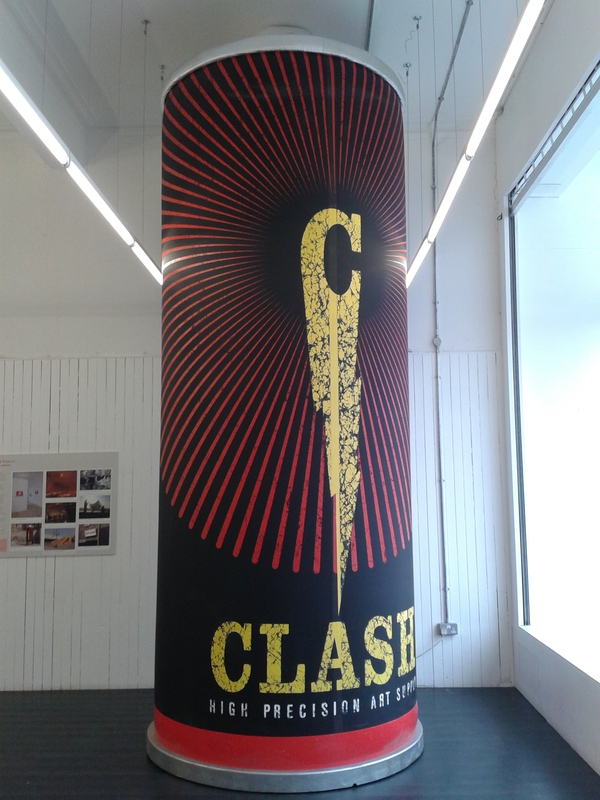 A fantastic new exhibition Above Scotland has just started at The Lighthouse. It has been produced jointly between The Royal Commission on the Ancient and Historical Monuments of Scotland and Architecture and Design Scotland and explores Scotland’s cultural landscapes from aerial photographic evidence. The exhibition comprises a wide number of high quality aerial images which show the remarkable diversity and richness of Scotland’s landscapes. 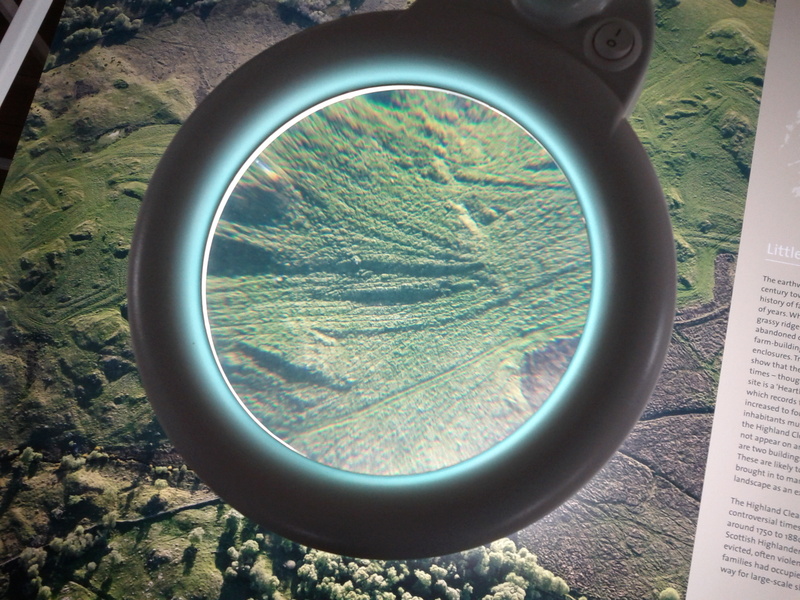 The provision of large interactive magnifiers at each display panel not only gives a sense of viewing the landscape through a plane window but also allows you to explore in more detail the complexity of the landforms, monuments and vegetation from above. As well as the panels, there are several engaging, and fun short films, produced as part of the project. These show the responses of local school children to local places as captured through their own aerial photography. The exhibition is also complemented by the publication of a new book Scotland’s Landscapes. It runs from 26th October 2012 to 23 January 2013, so plenty of time to go and get a different perspective on Scotland’s Landscapes…!